Georgia early voting is now underway and will continue until November 4 in all 159 counties. You can find your county’s early voting location(s) using the Secretary of State’s My Voter Page. You can spread the word about early voting in your county by proudly wearing your “I’m A Georgia Voter” picture and posting your photo on social media. Remember not to take your photo in vote polling site — wait until you step outside. 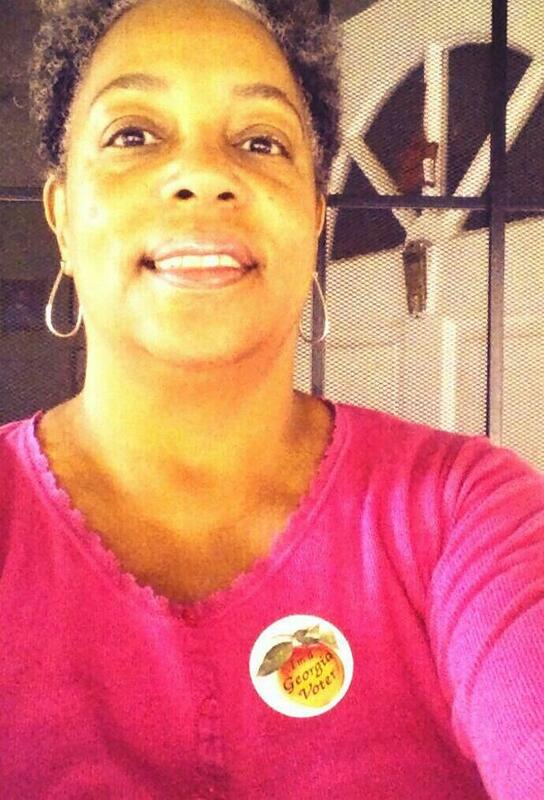 By sharing your #PostThePeach selfie, you can encourage friends and family to cast their ballots during early voting. For more fun, tag them and challenge them to cast their ballots during the early voting period. Across the state, thousands of Georgians cast ballots during the first day of early voting. 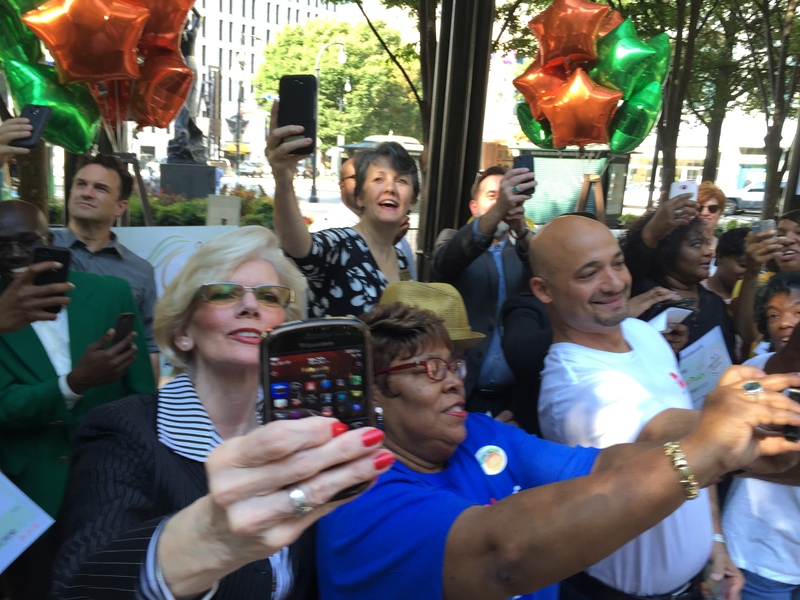 Nonpartisan organizations came together with election officials in Woodruff Park in downtown Atlanta to kick off early voting with speeches and selfies. 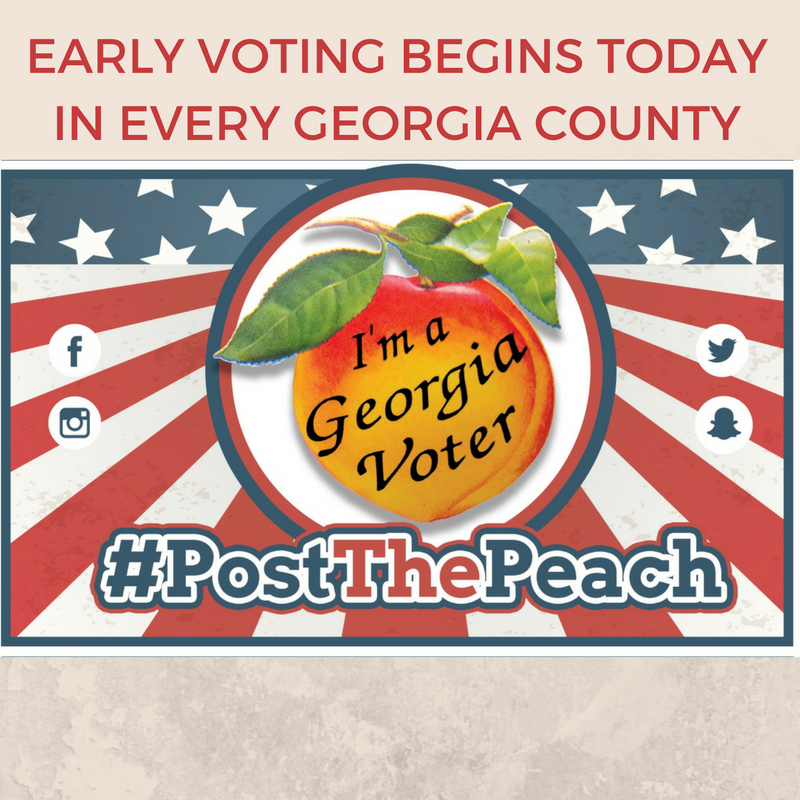 Just in time for the start of early voting, #PostThePeach 2016 will kick off on Monday, October 17. 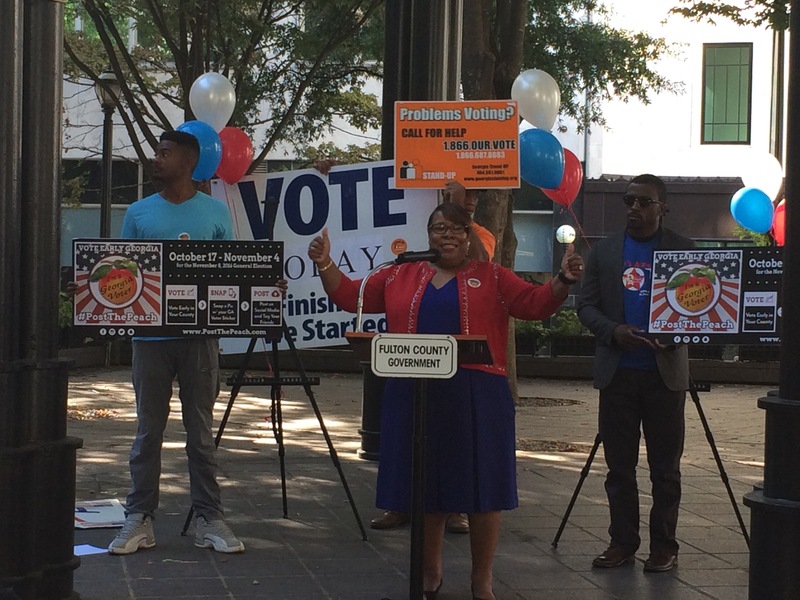 Elections officials across Georgia along with nonpartisan organizations encouraging voter empowerment are challenging Georgia voters to cast their ballots during the early voting period. 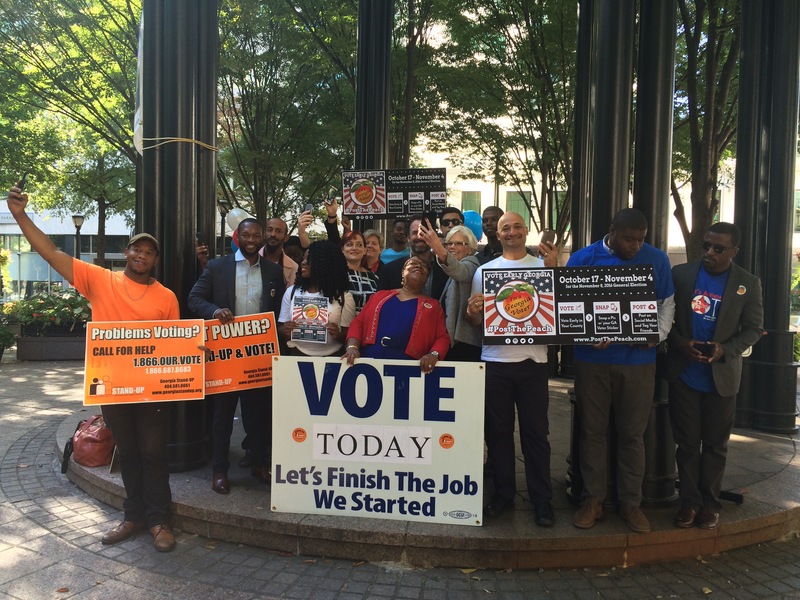 #PostThePeach coalition members will hold a press conference at 10 a.m. in Woodruff Park in downtown Atlanta. Georgia voters are challenged to cast their ballots during the early voting period and show off their “I’m A Georgia Voter” stickers as part of the #PostThePeach Challenge.. Early voting starts October 12. Often overlooked, municipal and special elections are of tremendous importance to the everyday lives of Georgians. 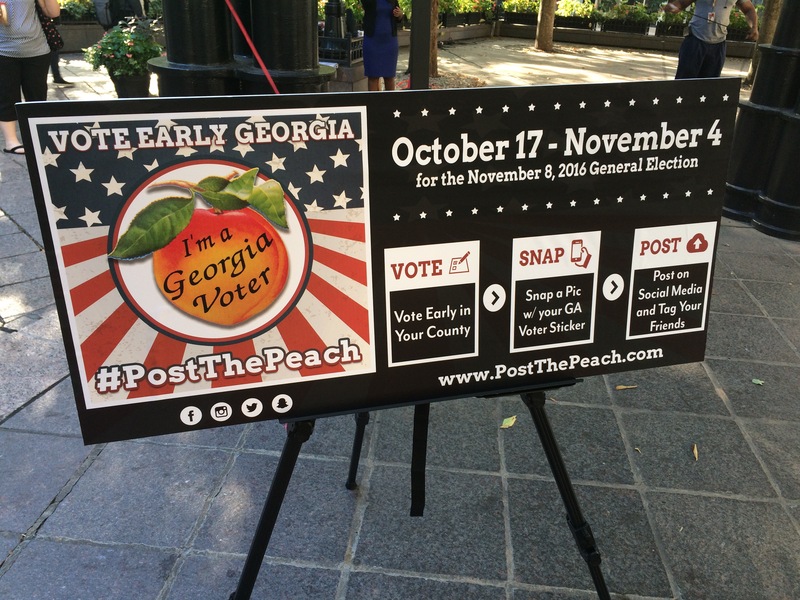 The nonpartisan #PostThePeach Challenge encourages Georgia voters to participate in upcoming municipal and special elections, especially during the early voting period. The Challenge is supported through a coalition of county election officials, civic engagement organizations and individual voters. After casting their ballots, Georgia voters are challenged to post “selfies” wearing their state-issued “I am Georgia Voter” peach sticker. Using the #PostThePeach hashtag, challenge friends and neighbors to also exercise their right to vote. 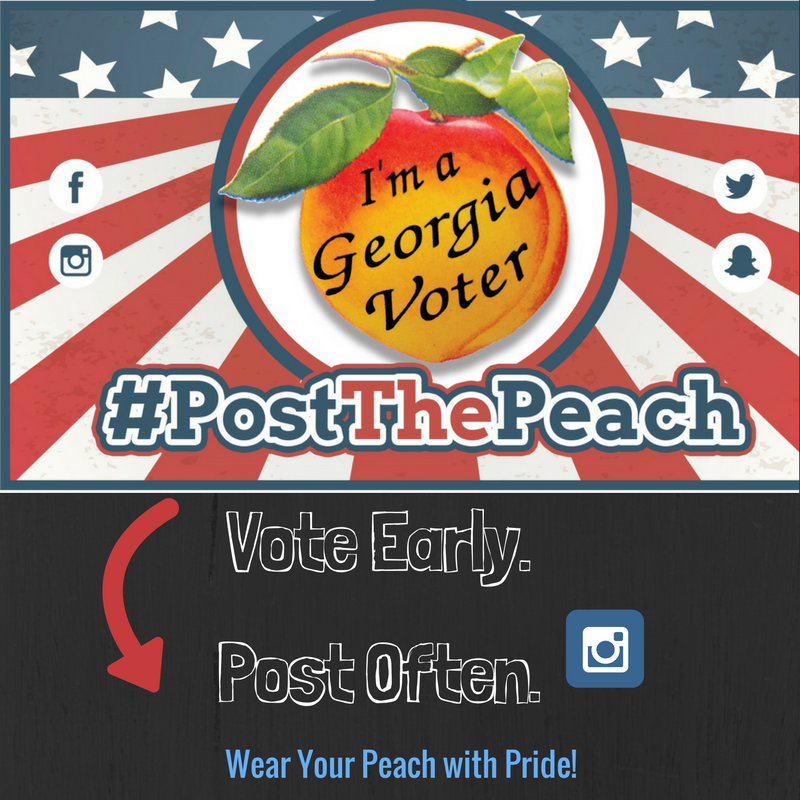 Social media graphics and more are available for download from the #PostThePeach 2015 Toolkit. Early voting begins October 12 in Georgia cities and counties with elections on November 3. Early voting saves time and is more convenient for voters with busy, modern lifestyles. But even more important, it allows for time for a voter to correct any unforeseen problem that may occur at the polls. Georgia voters will have three weeks to vote early prior to Election Day. In addition, voters can cast their ballots by mail and on Election Day. To learn more about elections on the ballot, as well as their polling location and the early voting hours and locations in their jurisdiction, Georgia voters can log on to the Secretary of State’s Georgia My Voter Page at http://www.mvp.sos.ga.gov/. 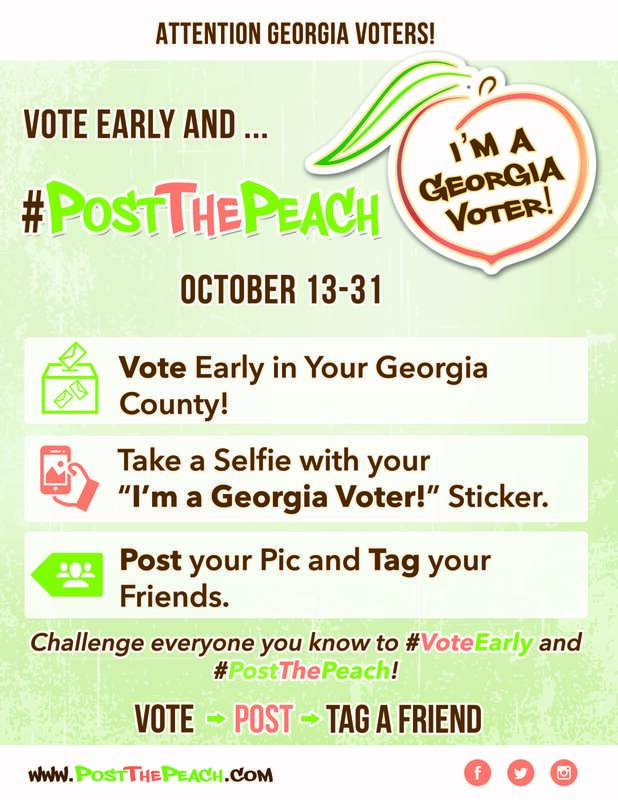 Early voting has started in Georgia and the #PostThePeach challenge is now underway! 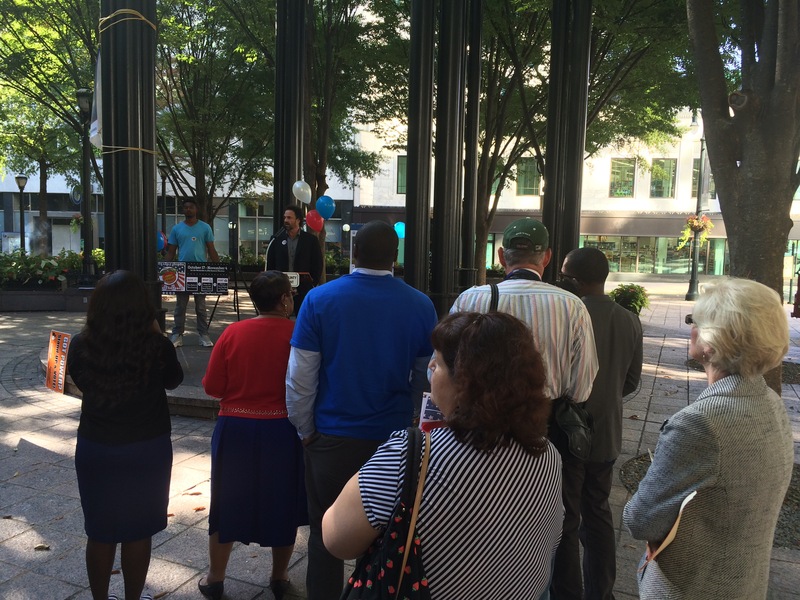 The challenge kicked off on Friday, October 10 just in time for the start of early voting on Monday, October 13, 2014. 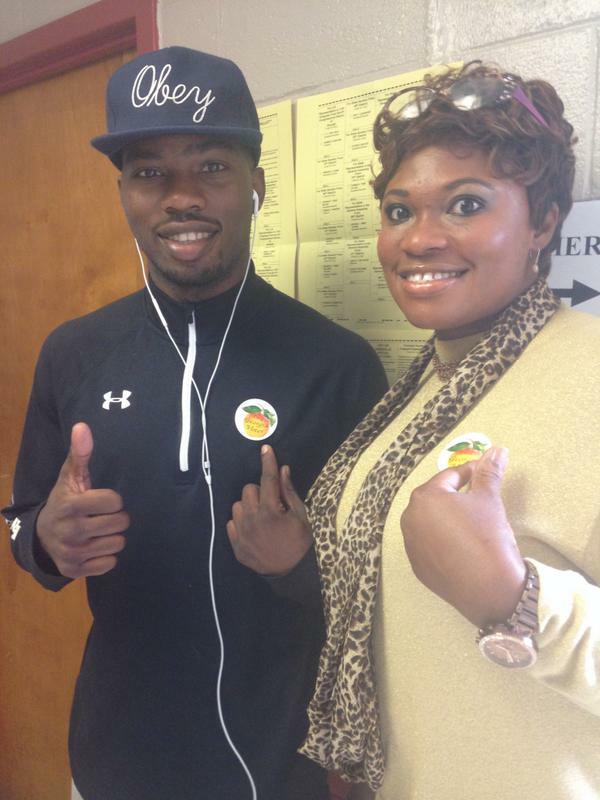 All 159 Georgia counties offer early voting, and many have already begun to #PostThePeach. It’s SO easy! Simply vote early in your county, take a photo wearing your “I’m a Georgia voter” peach sticker, post it on social media, tag your friends and challenge them to vote early. Early voting saves time and is more convenient for voters with busy, modern lifestyles. But even more important, it allows for time for a voter to correct any unforeseen problem that may occur at the polls. Georgia voters have three weeks to vote early, with some weekend voting hours available in all counties. In total, across the state, Georgia voters will have access to 261 early voting locations, a combined total of 28,262 weekday hours and 1,779 weekend hours for early voting, spanning across a minimum of 16 voting days, and as many as 19 voting days. Early voting for the November 4 General Election ends on Friday, October 31. 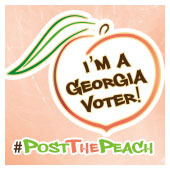 Voters across Georgia are challenged to show off their “I’m A Georgia Voter” stickers as part of the #PostThePeach Challenge, launching this week in time for the start of early voting. 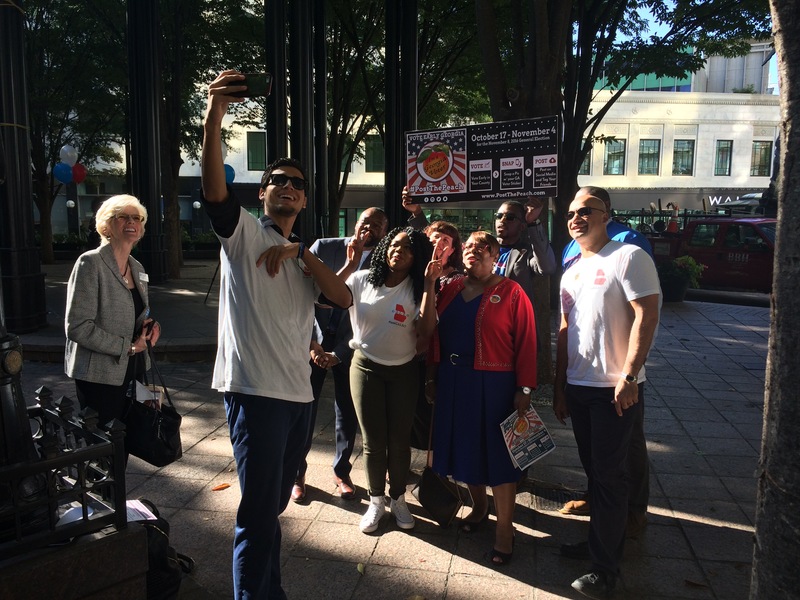 The #PostThePeach Challenge will kick off during a press conference on Friday, October 10, 2014, at 10 a.m. at Woodruff Park in downtown Atlanta. 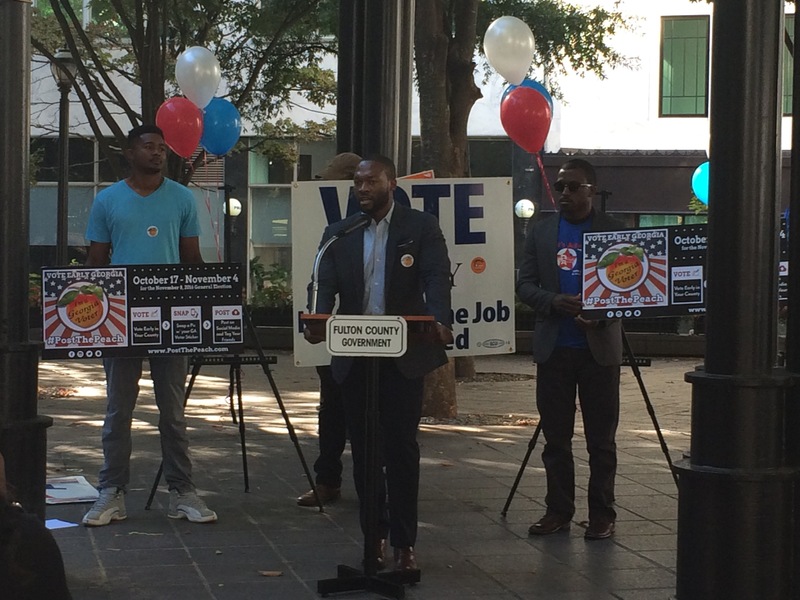 The #PostThePeach Challenge, initiated by a coalition of county election officials, civic engagement organizations and individual voters, asks voters across Georgia to cast their ballots during early voting for the November 2014 General and Special Election. 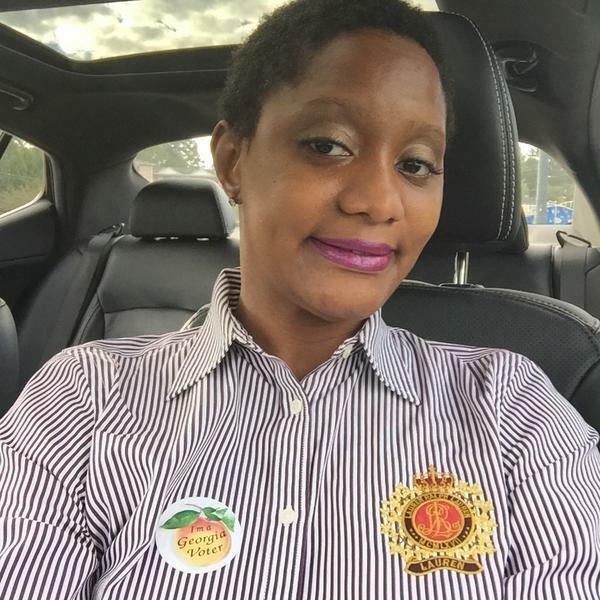 After casting their ballots, Georgia voters are challenged to post photos of themselves wearing their state-issued “I am Georgia Voter” peach sticker and to challenge others to #PostThePeach on Twitter, Facebook, and Instagram. Early voting across Georgia begins on Monday, October 13. Early voting saves time and is more convenient for voters with busy, modern lifestyles. But even more importantly, it allows for time for a voter to correct any unforeseen problem that may occur at the polls. Georgia voters will have three weeks to vote early, with some weekend voting hours available in all counties. In total, across the state, Georgia voters will have access to 261 early voting locations, a combined total of 28,262 weekday hours and 1,779 weekend hours for early voting, spanning across a minimum of 16 voting days, and as many as 19 voting days. In addition, voters can cast their ballots by mail and on Election Day. 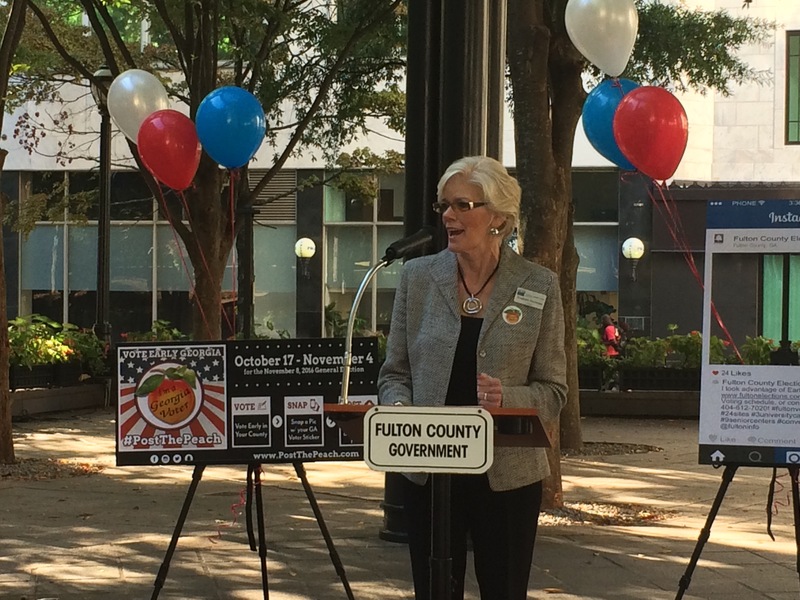 To find your polling location and the early voting hours and locations in your county, log on to the Georgia My Voter Page at http://www.mvp.sos.ga.gov/. For more information, email postthepeach@gmail.com.